There’s something about books that I can’t resist, and old books have a special appeal. 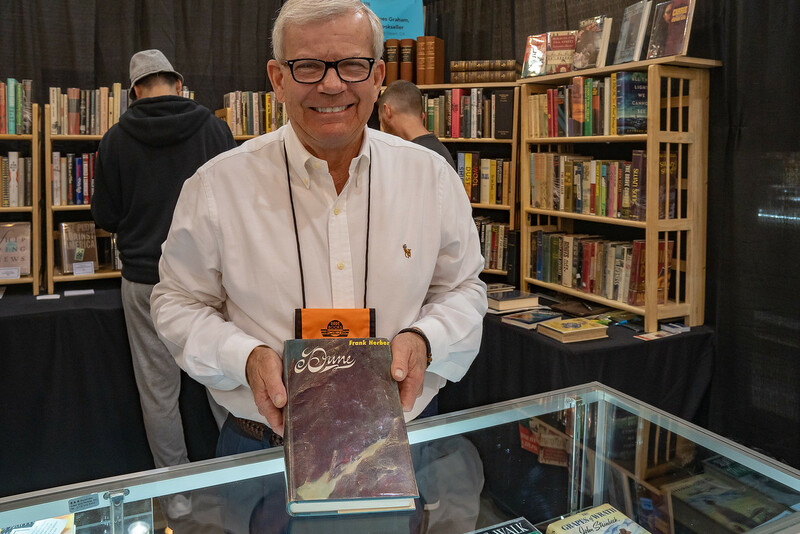 I attended the Rare Books Los Angeles event at the Pasadena Convention Center last week. Although I wasn’t buying, I did have a purpose. I went to see Garcia-Garst, my go-to source when I’m puzzled about an old book. These folks are wonderful. I first found them when we were looking for favorite books from childhood. After a terrific visit with Kenneth Garst, I resolved to take better care of my picture books! You can see just a bit of Jumanji by Chris Van Allsburg in the lower corner of the above photo. I shall make an effort to preserve my Van Allsburg collection. The show contained more than children’s literature. There were some seriously old volumes as seen in the title photo. 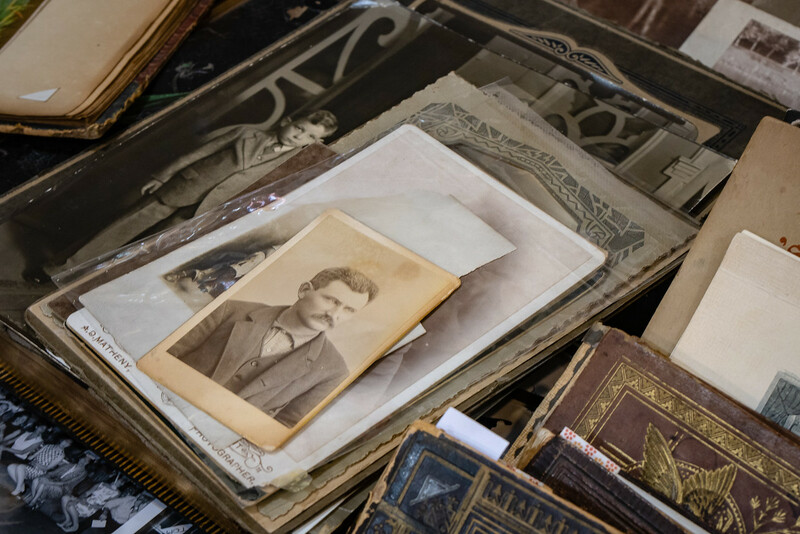 Many vendors offered ephemera, decorative arts, and photographs. As a photographer, I do enjoy seeing old pictures. They’re mysterious and compelling. Who are the people? Why do we have these photos? What’s the story behind the picture? Do I sound nosey? Well, perhaps I am. I can’t resist talking to people. Each vendor had a story to tell. I took the above image of the photographs at the Popartink booth. We met the owner of the booth who told us the organizers set up the booth with the wrong name. Alas, I didn’t hear the correct name, so I can’t repeat it. Instead, I’ll show another photo of her area. If the woman I met reads this post, I hope she leaves a comment with a link to her business. Her booth contained all kinds of treasures. I discovered a few personal treasures as well. You didn’t think any reference to Star Wars would escape my eye, did you? Neil MacDonald Had a display I couldn’t resist. 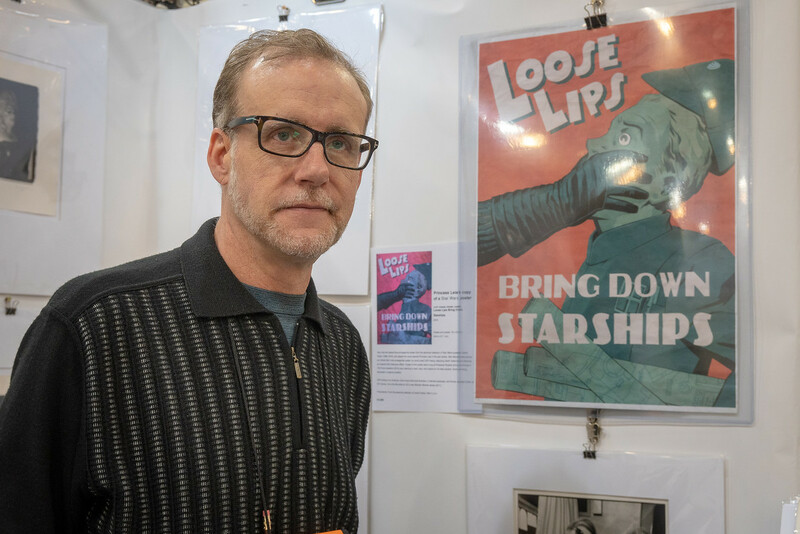 The “Loose Lips” poster was part of the Carrie Fisher estate. 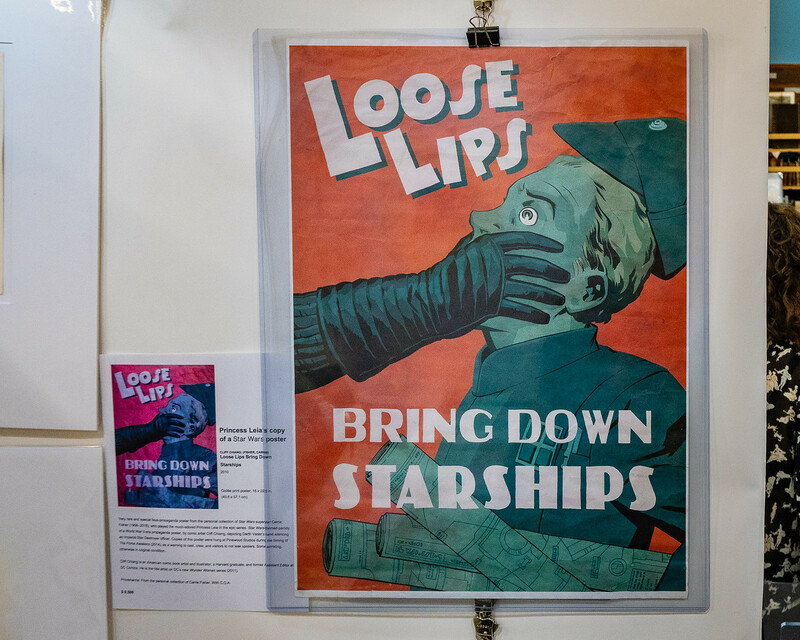 Mr. MacDonald told us the story of how there were several such notices posted around Pinewood Studios during the filming of The Force Awakens. This message was a gentle reminder not to let anything slip to the media. Here is a slightly better photo. I held the camera up in the air to avoid the reflection from the ceiling lights. I’ll close with a great story from Jim Graham. He had a first edition of Frank Herbert’s Dune. The price in the dust jacket said $5.99, but at some time the book must have been discounted. In pencil, it was marked down to $4.59. We had a good chuckle that Dune, a mega-seller started slowly. Then Mr. Graham dropped the other shoe. The book’s publisher wasn’t some well-known house, but Chilton. That’s right. The same Chilton who is famous for the yellow automotive manuals. It’s tough finding a publisher when you first start writing! Antiquarian book fairs aren’t dull and stuffy. The value of a book depends on its condition and whether it’s a first edition, first printing. There can be several printings of the first edition. Book fairs are a little bit of nostalgia as one discovers the books from childhood. 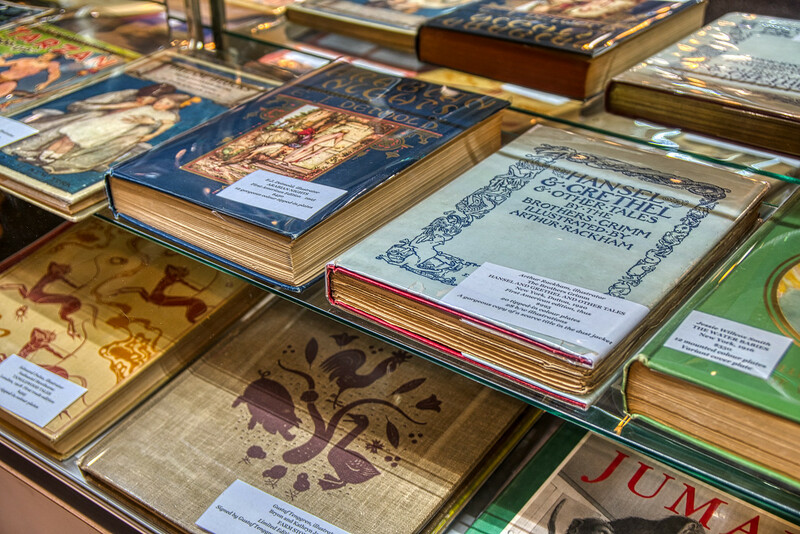 These rare book events are taking place all year long, across the country. 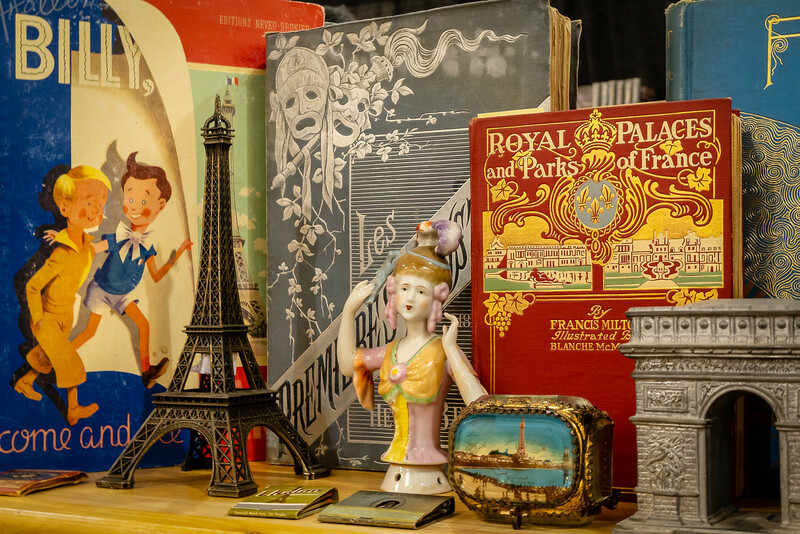 The 52nd California International Antiquarian Book Fair is taking place February 8-10 in Oakland. I hope you get a chance to visit a book fair. Meanwhile, you can see more photos from my recent visit by clicking here.